Every year we give thousands of New Zealanders a potentially life-saving blood pressure check - for free. Every year we run a very special event that helps keep thousands of Kiwis safe from stroke. It's called the Big Blood Pressure Check, and it takes place on the first Saturday in October. We offer everyone a free blood pressure test, which only takes a minute but could save a life. That's because high blood pressure is a leading cause of stroke. Many Kiwis don't know they have it, but it's easily detected and can be treated. You can read more about blood pressure here. Thanks to our team of supporters and volunteers, we have testing stations at New World and Pak 'n Save supermarkets and various other sites around the country. Over the 10 years we've been running the campaign, we've detected high blood pressure in thousands of people and advised them to see a doctor. We are extremely lucky and grateful for the support of TV stars Miriama Kamo and Mike King, who have helped publicise the event, free of charge. 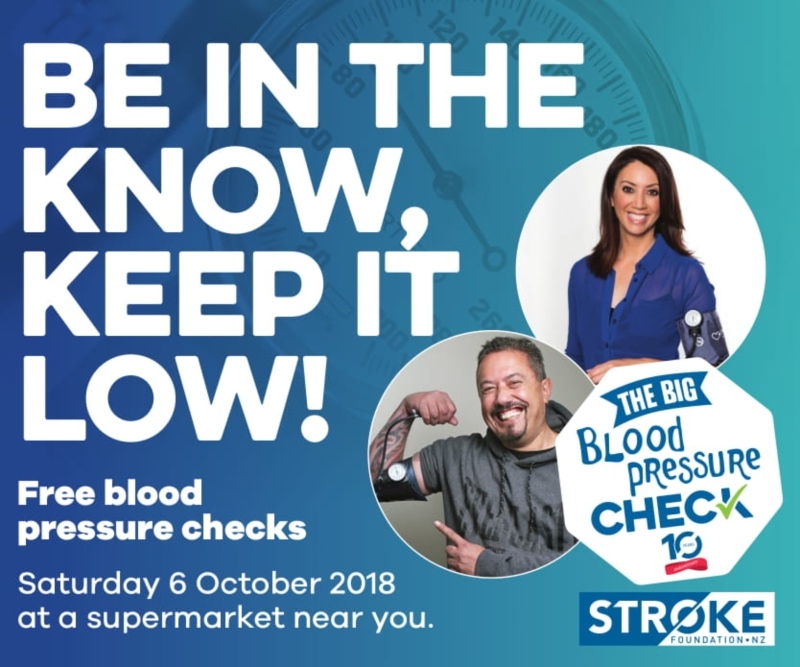 The Big Blood Pressure Check has featured on TVNZ's Breakfast, Stuff and in the Herald on Sunday. Please read and watch an excellent story Miriama did with the Herald on Sunday here. We acknowledge and thank our supporters New World, Pak 'n Save, Rotary, St John, Wellington Free Ambulance and stroke club volunteers.